People opposed to the Carmichael mine formed a #stopadani hash tag on Bondi Beach. Photo from @stopadani. Declaring it a "national day of action", anti-coal mine organizers held rallies in several locations across the country including Sydney, Brisbane, Melbourne, the Gold Coast and Port Douglas in North Queensland. 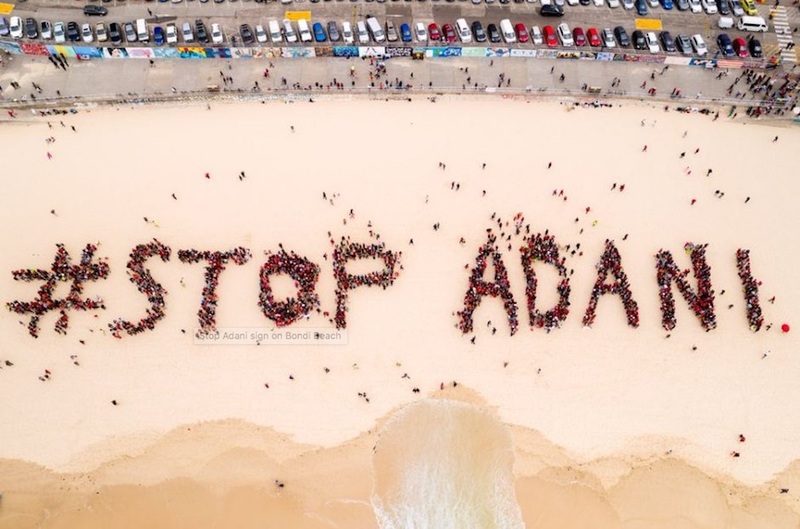 Protesters spelled out '#STOP ADANI' by standing in formation on the sand, ABC News reported. It adds that state and local governments have defended the mine approval process, with Queensland Minister for Natural Resources and Mines Anthony Lynham saying the mine would be strictly monitored throughout construction. According to official estimations, the Carmichael mine will contribute $2.97bn each year to Queensland’s economy and has the potential to create 6,400 new jobs. The proposed mine has attracted the usual polemic between pro-industry forces and anti-development voices including those who say the mine will fuel global warming and destroy the Great Barrier Reef, which lies offshore from the mine. Mine supporters argue the mine will bring much-needed jobs to the area. In June Indian conglomerate Adani Group decided to go ahead with its $12 billion (A$16bn) Carmichael coal mine and rail project in Queensland, Australia, one of the world’s largest thermal coal mines approved in recent years. The conglomerate has agreed to pay the state hefty royalties on the coal produced there and follows years of opposition to the project by organizations ranging from the United Nations to green groups and locals. The project, the largest single investment by an Indian corporation in Australia, is meant to produce 60 million tonnes of thermal coal a year for export, fuelling power generation for 100 million Indians. Coal from Carmichael is also expected to be sold in Vietnam, Bangladesh, China, Philippines and Pakistan. Construction of the mine is scheduled to start in the next few weeks. Reuters reported last week that Adani thinks it should be able to tie up financing by March 2018, and may look at selling a minority stake to raise funds. Also up in the air is an A$900 million loan from Northern Australian Infrastructure Facility (NAIF) for its rail project – to move coal from the proposed mine site in the Galilee Basin 388km to the Abbot Point coal port. According to a poll released Sunday, 68% said they support a taxpayer loan to Adani to assist construction, while 16% opposed the loan, The Guardian reported.